The Battlefield Mod Development Toolkit 2.75 is available! The Battlefield Mod Development Toolkit 2.5 is available! Menu Editor Fix ..this is now fixed in MDT versions 2.5 and above..
What is fixed: Adds new object types to allow loading of additonal menu files in the Menu Editor. 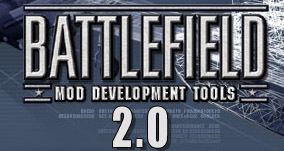 The Battlefield Mod Development Toolkit 2.0 is now available! The MDT site has been updated to support Battlefield Vietnam. The MDT team has released MDT Version 1.0c, It now supports Discreet's free GMAX product for 3D modeling and animation. * GMAX must be downloaded and installed seperately. Once installed, you can instal the MDT GMAX tools. The MDT team has released 3ds max sample files for Battlefield 1942. Check it out here or go to the Tools section. MDT Version .9c has been released, get the latest version. DICE has created some documents on AI for the Battlefield 1942 mod community. Updated the Damage System Tutorial. Updated BFReports and Conanalysis scripts in the Overview Tutorial. Updated the Damage System Tutorial. Thanks to DICE and Eric Hanes for the update. Welcome to the Battlefield 1942 Mod Development Toolkit site. Here you can download all the neccesary tools for developing your own mods based on Battlefield 1942 as well as tutorials and examples on how to use these tools. To get started, download the beta version of the Mod Development Toolkit. Once installed, start going through the tutorials. In the coming weeks you can expect to see more advanced tutorials and minimods coming online as well as full GMAX support. The Mod Development Toolkit team. Added new an Overview of the BattleField 1942 Damage system. Added new an Overview of the BattleField 1942 system. Added new Land Vehicle Tutorial. This will set you through the process of creating a new land vehicles in BF1942.